There are two workhorses in the optimize toolkit that are essential for effective online marketing. 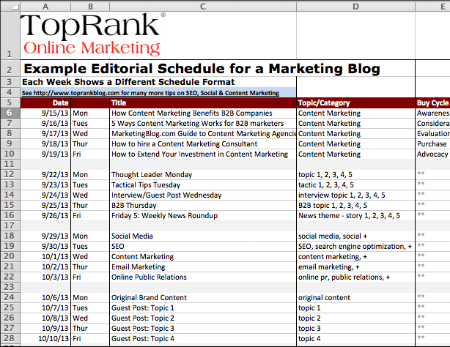 A keyword glossary template and an editorial plan template. Basic management of keywords keeps content marketing efforts on track with topics and keywords that matter to customers. They help manage the mapping of keywords to content so content assets don’t get too keyword heavy or light in any particular area. 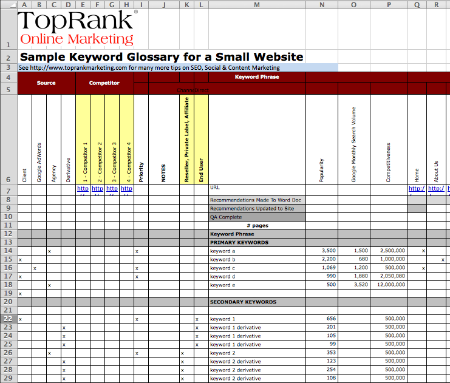 Below is a link to a basic keyword glossary that will be a helpful tool for tracking keywords on a small website of under 500 pages. I have every intention of updating these templates and adding more as we go, so be sure to sign up for our mailing list (we respect your privacy in a big way) in the upper right of the page so you can get a notification when updates are made. With havin so much written connett do you ever run into any issues of plagorism or copyright violation? My website has a lot of unique connett I’ve either written myself or outsourced but it seems a lot of it is popping it up all over the web without my agreement. Do you know any solutions to help reduce connett from being ripped off? I’d certainly appreciate it. Ian, one thing you can do is to monitor for scraped content by using copyscape.com or running a search on Google of headlines from your posts (in quotes). That will find instances of others copying your content. You might also include rel=canonical in your links to properly attribute links to your site when others copy it.